San Diego’s mortgage meltdown and budget constraints have forced Chula Vista to cancel its big annual fireworks display, and Valley Center has fire safety issues, but the 4th of July fireworks displays in the rest of San Diego County will light the skies this Friday night. July 4, 9 p.m. Day-long festivities with a parade at 10 a.m.
July 4, 9 p.m. Food and music are part of the celebration happening earlier in the day. July 4, 9 p.m. Daylong festivities. July 4, 9 p.m. Afternoon festivities, including game and food booths, music and entertainment. July 4, 9 p.m. Grounds open at 5 p.m. for town picnic including food booths and games. July 4, 9 p.m. Daylong festivities kick off at 10 a.m. in Webb Park. Canceled this year. Back in blazing colors in 2009! Wednesday, 9 p.m. Food, music, and entertainment will be featured beginning at noon. Wednesday, 9 p.m. Carnival rides, games and food booths also. The Boss loves fireworks, and now she loves you. I never knew there were that many places to see the shows. Does the Boss like nice California Cabernets? If so–or even if she prefers something else– give me a call and perhaps we can meet at La Costa for their fireworks show. We were going to enjoy the fireworks extravaganza in Oceanside, but don’t want to battle the traffic. I’ll let you know — thanks for the invite. Great list of upcoming events. I had heard there was a fire safety workshop for parents, but haven't been able to find it yet. However, looks like our family calendar will be full for awhile. Thanks! Fireworks are so cute, especially if there's too many. But the best thing in seeing a firework is that when your on the middle of the ocean and there's a fireworks. 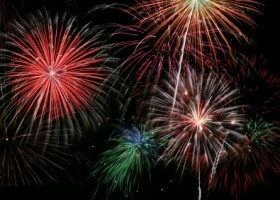 I really love watching fireworks display.. especially when your love ones is with you..